In a hotly contested mid-week race, Matt Stevens (in his Galletta's #3) collected his 3rd win of the year passing the entire field in twelve laps. Mark Miller (in his #007) and Mike Billion (in his #57) followed with more strong performances. Tom Murray led eleven laps early (in the rented Galletta's #7), but was then passed by a deluge of points-leaders. Ogre (in his Galletta's #4) was running a strong 2nd place early, but attempting to pass Murray, buckled under the pressure, collecting another painful DNF. Chris Stevens (running the Galletta's #0) had to recover from several wrecks and near-wrecks to get 4th. Adam Barlow (in the Galletta's rental #1) escaped un-wrecked and injury-free, something that he had been unable to do with his last few attended races dating to last year. Neil Gosch (in his #44) continued his streak of win-or-bust by dropping out midway through the race. He won the only race that he finished. On a side-note Bill Hardy (in the Galletta's #2), after bragging about his racing prowess and 174 wins in the last year of racing, oddly retired on the 1st circuit with no Kart problems. 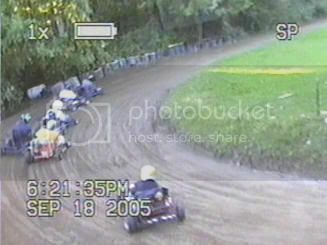 Videotaped race.